I usually fetch my Pan Pastels to add colour, quick and easy, to my embossed card. But another lovely quick and easy effect is to stamp and apply the Pan pastels. This is even better using the new metallics pastels. 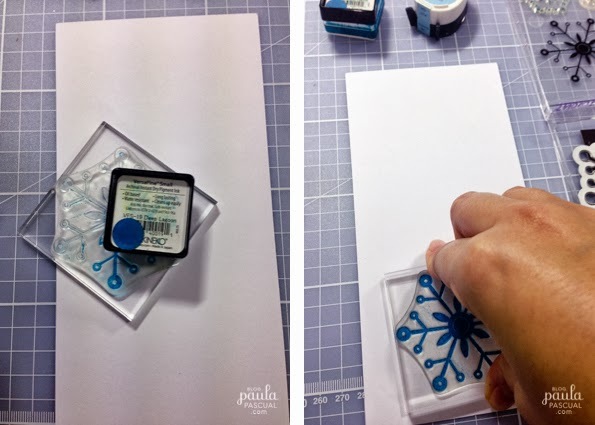 For this one I am using the snowflakes stamp and framelits dies set, white smooth card and inks. 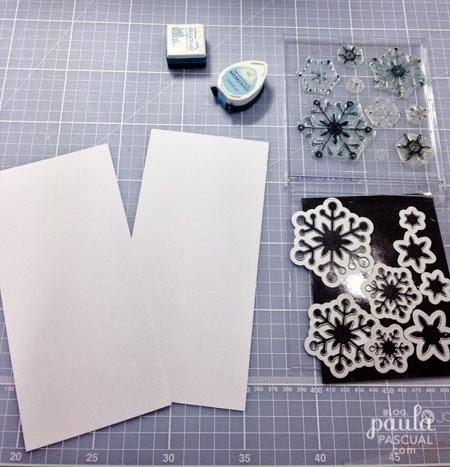 The classic way of stamping and pastels is using Versamark or any sticky clear ink pad. 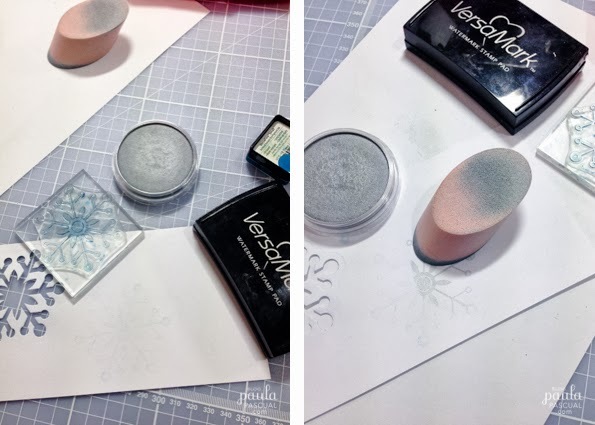 After the clear ink has dried, gently apply the Pan Pastels with a Sofft sponge tool with dabbing motions. To add more colour, I inked the stamp using Versafine ink pad. I always rotate the stamp while inking this allows me to get a better impression. 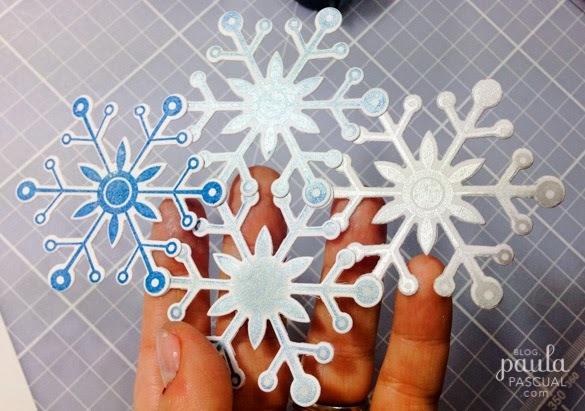 If I don't rotate the inkpad the ink will be a bit uneven, as shown on the top snowflake. 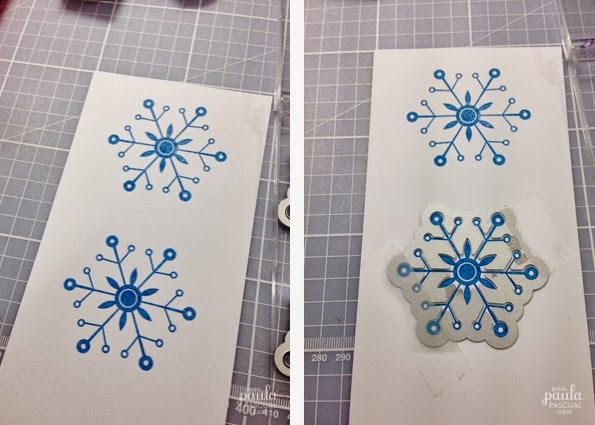 Then I placed the snowflake die and secure it in place with low tack tape. 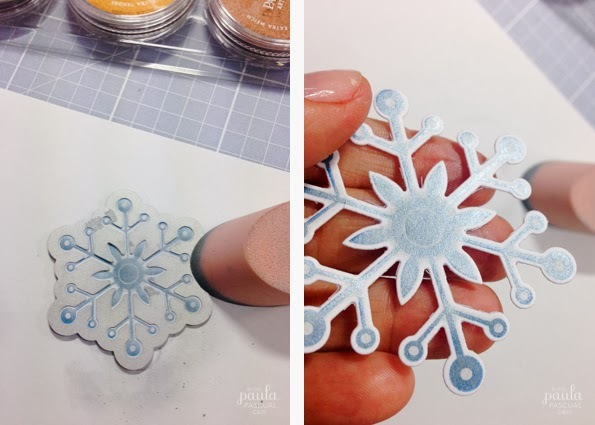 Once die cut keep the die cut in place and apply the metallic pan pastel. As you can see the metallic effect almost all over, except for a white edge all around. Here you can see all the different effects. Clockwise from the left, plain Versafine Deep Lagoon; Versafine with Metallic Pan Pastels and then die cut; Versamark with Metallic Pan Pastels and then die cut; and Versafine, die cut and then Metallic Pan Pastels. Slightly different effects!